After doing a bit of research into the need for and benefits of probiotics for one's digestive health and overall well being, I have been testing Member's Mark 4X Probiotics for the past nine days. The results I have experienced are nothing short of astounding! Learning of the significant impact one's digestive system has to so many other bodily systems was a great surprise to me. You may read more of the details via my previous piece, Top Five Digestive Health Issues In Women. Finding myself checking off so many concerns on the list of possible related effects of digestive malfunction, I was quite enthusiastic to give probiotics a try. The first day of testing, as opposed to less discomfort and bloating, I seemed to experience the exact opposite. Fortunately, I was forward thinking enough to continue with the testing! By the second day, the increased bloating and general digestive region sensitivity was gone. On day three, I felt an overall sense of lightness; certainly the absence of any bloating. As the week progressed, I found myself sleeping more soundly and for longer periods of time. My overall energy level went through the roof! From those benefits alone, I feel like a new woman! Although I do not classify myself as lactose intolerant and have never been diagnosed as such, I have experienced some negative effects on days when my overall dairy intact is greater than usual. A glass of milk, a yogurt and perhaps ice cream for a treat in the course of one day is enough to stir up trouble within my digestive system. Throughout the course of the test, I made it a point to maintain a typical diet, although I intentionally increased my dairy intake on day five. The results - no ill effect whatsoever! 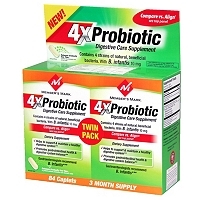 While I cannot speak to the possible results another may have in trying Member's Mark 4X Probiotic, based upon my experiences, in addition to all I have learned about the importance of digestive health in one's overall well-being, I would certainly encourage my readers to explore and try for themselves! Created with a probiotic blend of recommended beneficial bacteria (Bifidobacterium lactis, Bifidobacterium longum, & Bifidobacterium bifidum) at "5 billion live cells at time of manufacture and an effective level at time of consumption" and based upon my personal experience, Member's Mark 4X Probiotic is a budget friendly and effective means to a healthier you. This shop has been compensated as part of a social shopper insights study for Collective Bias. The opinions above are both honest and my own. Images and information sourced from http://digestivehealthfor.me/. Additional information sourced from women to women, Web MD, AMA. I have trouble with dairies myself. The more I hear about probiotics digestive health the I think I need them. I like the idea of feeling better. That is awesome!! Good for you for taking the long view and sticking with it; sounds like it is was worth it!